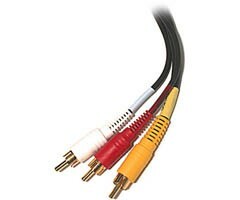 This is a 6 ft. long, stereo audio/video RCA cable with gold plated connectors. Both ends of the cable have 3 color coded and labeled RCA plugs (video and L+R audio). The video cable is an RG-59 coaxial cable.